Fall migration is well underway here in Northern WI. It is an atypical year. Our resident Barn Swallow family left the property in July 24th. That used to be summertime in my memory. Apparently this year, July has become autumn. 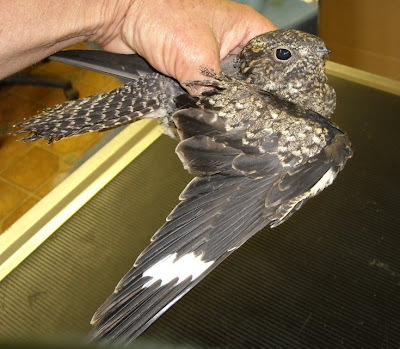 The migration time for the Common Nighthawk begins in our area August 22nd. We don't have a firm grasp on how the birds do it, but come August 22nd unless there is a downpour of rain or worse, you can count on seeing flocks of nighthawks soaring and swooping to capture the insects that "bug" us humans. The winter home for the Common Nighthawk is in South America. When you look up and see these magnificent winged creatures, just think about the long journey they have ahead of them to South America, as far as Argentina, and back to our region before they breed again. They are miracles on wings! The Nighthawk is an amazing bird. They eat only insects. Their method of capturing insects is to swoop though the air with their huge mouth open trapping insects as they go. Unfortunately, when these elegant birds are doing all that that swooping, they occasionally dive in front of a car. That, is where we are REGI come in and admit them as patients. Sometimes it is a small injury but it is happens to be something major we have to "send" them to the southern states via jet plane after they have recovered or if they cannot be released they can be placed with a captive care situation. People are sometimes afraid of these gentle birds in part due to their name. The dictionary definition of "hawk" includes the word as a verb which means "to swoop and strike in the manner of a hawk" . They swoop after insects with a wide open mouth measuring up to 2 inches wide. That is a BIG MOUTH! Scientists that study such things have found over 2000 small insects in the stomach of one migrating bird at one time! Another bird held over 500 mosquitoes when examined. 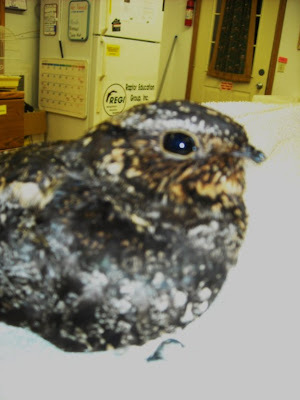 The Common Nighthawk is definitely beneficial to humans and a bird that we need in our lives. Long ago, when birds were being named, people likely didn't quite know where to categorize these interesting looking birds. They are in the family Nightjar or sometimes Goatsuckers. We can understand the Nightjar part, but the term Goatsucker has an interesting story behind it. Long ago there was a legend that these insect eating birds sucked the milk from goats at night. As odd and even hilarious as that sounds today, people actually believed it way back when. 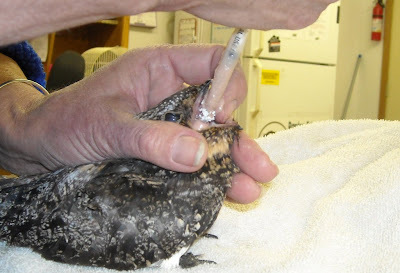 Nightjars were killed to protect the goat milk supply. People have an active imagination especially when they feel vulnerable and not totally in control of things like at night. So there you have it. 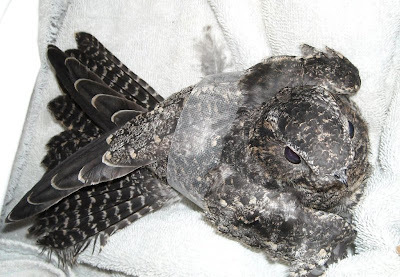 A rundown on the amazing Common Nighthawk. We currently have eight in our clinic. I am amazed each and every time I see them.